Steven Bathiche, Director of Research at Microsoft’s Applied Sciences Group has introduced a pen that is going to make headlines in the tech world. Bathiche has built a computer with almost zero latency when you do something on it, it reacts instantly. He has solved the most irritating problem where you write or draw on a screen and the ink is always some seconds behind your finger. Bathiche’s lab has many amazing prototypes. A pen is among the many innovations. Bathiche claims that using a keyboard to type letters is one of the hardest thing to do. He claims that the pen is and can be used as a powerful computing tool. In addition to that, the touchscreens and keyboard will soon be outdated. “We’ve spent literally hundreds of years perfecting these implements—they’re comfortable and natural in our hands, and you instantly know how to use it. Even as technology has morphed the shape and size of everything from our cars to our thermostats, the pen’s form hasn’t changed. What’s changing, dramatically, is what we can do with it.” Bathiche says. Humans are used to using tools like pens, brushes and scalpels in drawing staffs and that can not be compared to using a mouse or pads of our fingers. The pen is opening up new ways of digital expression, new tools for communication, new ways to interact with our tech. Computers have evolved creating their own foam of intelligence knowing what a person wishes to write or draw and understanding complex inputs. Pens like Livescribe and Phree, turning pen input into digital output happens more naturally than ever. A person can write with the Livescribe pen, in a Moleskine notebook just like the one you’ve always used, and all of your handwriting is instantly and perfectly digitized. The Phree pen can be used to write anywhere; on the tables, the sofa, on the floor and have it show up on your phone’s screen in real time. The Microsoft team has been experimenting with a search tool that lets you draw your search query. In a demo Bathiche sketched a crude Eiffel Tower, and Bing-powered image results populate and at night the pen can switch its digital ink to yellow and provide light. Batihiche drew an arrow and the app recognized what he made, smoothing out lines and sharpening corners to look like an actual arrow. Livescribe’s pen uses special paper which helps the system digitize your writing for you. With Phree, you’re separating input and output, like moving a mouse in your hand and seeing the cursor on the screen move—nothing comes out of the pen when you scribble it, but the exact lines show up on the screen. The Microsoft team have brought the normal feeling of a pen and paper to the digital era. Surface team with Microsoft’s OneNote team built a feature that launches an empty page as soon as you click the pen’s surface, even above the lock screen, so you can start taking notes as fast as flipping open your notebook. 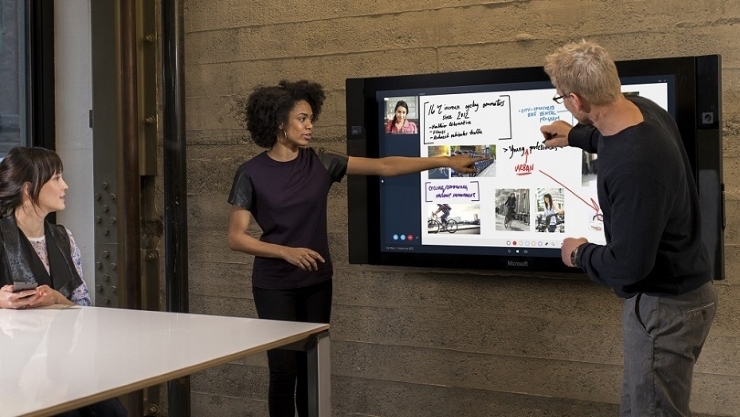 The Microsoft’s surface hub is amazing and designed to advance the way people work together naturally.You can walk up and join a Skype for Business meeting with a single tap, and share content effortlessly, so that you spend your time connecting to people rather than technology. And since you can easily send meeting notes and content, you can communicate outcomes and action points. The pen is used to draw on the surface using a special kind of film that makes the surface feel less like glass.